Our New Jersey construction attorneys represent homeowners who, through no fault of their own, have construction liens (called “mechanics liens” in years past) filed against their property. A typical scenario goes like this. 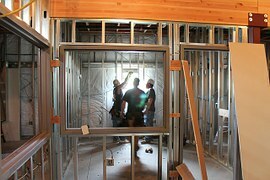 The homeowners hire a contractor to do work on their home. The contractor does substandard work or does not finish, so the homeowner does not make the final payment. The contractor then files a lien on the property under New Jersey’s Construction Lien Law. Another typical scenario results when the work is fine, but the contractor fails to pay a subcontractor or supplier. Then, in many circumstances, the subcontractor or supplier can file a lien against the homeowner. Contractors love construction liens because they are a great tool to help them get paid. This is because construction liens can cause great difficulties for homeowners. For example, it will be difficult, if not impossible, to obtain any type of financing, such as a second mortgage or home equity line of credit (known as a HELOC) without the construction lien being discharged or paid off. Indeed, many mortgages require that homeowners not allow any liens on the property, and may specify that the filing of a lien is an event of default under the mortgage. In worst case scenarios, a construction lien can be foreclosed on. Our New Jersey construction attorneys have utilized the wide range of defenses allowed under the New Jersey Construction Law. First, there must be a written contract – without a written contract, a contractor (or subcontractor or vendor) cannot file a construction lien. Indeed, for renovations on private residences the failure to have a written contract which includes specific required information can also be consumer fraud, entitling the homeowner to recover triple damages and have the contractor pay their attorneys fees. Another defense is that there is no “lien fund.” New Jersey’s Construction Lien Law provides that a construction lien may not exceed the amount of the written contract which remains unpaid. Thus, in the subcontractor example above, assume that the contract was for $100,000, and the homeowner paid the contractor $100,000. Thus, the contract was paid in full and there is no lien fund. So even if the contractor wrongfully failed to pay a subcontractor $50,000, the subcontractor has no remedy against the owner. The subcontractor can still sue the contractor for the $50,000, but it can’t file a lien against the property. Still another defense is the New Jersey Construction Lien Law’s strict time requirements. A lien on residential property must be filed within 120 days from the last work, and a suit filed against the owners within one year, both from the date of the last work (suit must be filed within 30 days if the owner serves a written demand on the contractor). If these time frames are not met, the lien can be discharged. A construction lien must be filed for the unpaid amount of the lien fund within 120 days from the date of the last work performed by the contractor or subcontractor at the residential property, or within 120 days from the last date on which a vendor provided materials or supplies. Before the lien can be filed, however, a Notice of Unpaid Balance and Right to File Lien Claim (called a “NUB”) must be filed with the county clerk in the county where the residential property is located within 60 days from the date of the last work. The New Jersey Construction Lien Law then requires construction lien arbitration – to determine the amount of validity of the lien – it is a prerequisite to filing a construction lien. The lien must be filed within 10 days after receipt of the arbitrator’s decision. Suit against the homeowners must be filed within one year, or 30 days from the homeowner’s written demand. Our New Jersey Construction lien lawyers have had considerable success in construction litigation. If a construction lien has been filed against your property, or if you have any construction law issues, please email us or call (973) 890-0004. We can help.